Many of you know how much I LOVE using coupons and getting exceptional deals on groceries. For me, the key is to keep my coupons neat and organized so I can always find the ones I need when I need them. If I can’t get to my coupons easily, I’ll forget about them. Sound familiar? To keep them all organized, I use a coupon organizer (big surprise)– and I ‘trick it out’ with some fun accessories. The first step is to decide on 12 to 13 main categories and then divide those into sub-categories. PAPER: kitchen — bathroom — baby — medication — misc. NOTE: Feel free to use whatever categories fit your shopping needs. Next steps: alphabetize your categories, write them on the colored papers, and insert them into your organizer. Now all you need to do is insert your coupons! 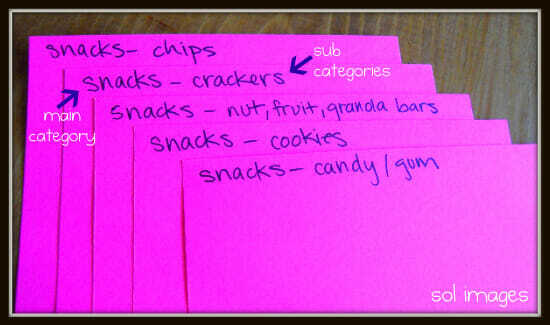 Once your coupons are organized, it will be simple to find the coupons you need for your grocery shopping each week. To make my life even easier, I always paper-clip my coupons to my weekly shopping list. That way I know what coupons go with each store’s list and I’m organized and ready-to-go when the cashier asks for my coupons. You can download and print a variety of shopping lists here. If you still feel like coupons just won’t work for you — there are lots of ways to cut your grocery bill with out cutting coupons. However, if you are are willing to give coupons a try — and I hope you are — make you own coupon organizer and start clipping! What about you: How do you organize your coupons? Do you have a trick for using before expiration? I put mine together today. I’m hoping it works better for me. I’ve lost total interest in couponing except those that jump right out at me and I can use them at CVS. I had been using the binder system and it just got too overwhelming. Thanks for your website. I love it! Thanks Lisa – hopefully you find a coupon system that works for you! what is card stock? Is it easy to find? I love love love your site. I found a link on Pinterest (best invention ever). I have been just looking around and discovered your coupons. You are one whom I admire in that. We just came into a small very temporary financial hardship. I have been very buckled on our finances and not buying unhealthy foods. I am feeling more inspired to keep going, my husband is shocked with what I am doing so far. I haven’t done much starting out, but I am learning. He is going to be totally shocked when I save even more 🙂 PS, I totally love your new home! I just found your link on pinterest & really like this organizing idea. I’ve found with a child in the grocery cart, the binder method is just too bulky for me. Were you able to find that size cardstock to buy, or did you have to cut it yourself?? 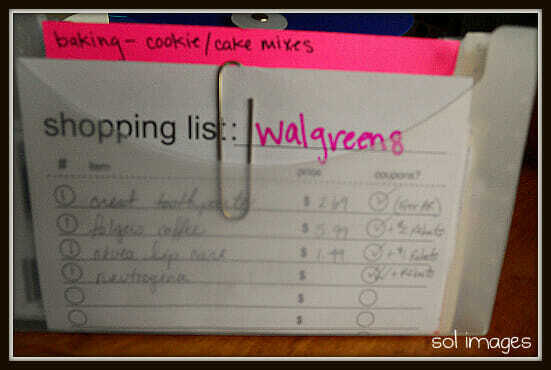 I had never read about your great savings until today…thanks for sharing that grocery list too. I’d just transitioned to an app on my smartphone when my phone DIED in the middle of the grocery trip Monday morning. Hoping this list will work for me…I tend to leave paper lists at home after I make them…sigh. haha — yes Tammy, I LOVE my coupons and deals! I also love using my paper shopping lists so hopefully they will help you out too! I’ve just had a moment to browse through more of your website. You are definitely a girl after my own organized heart! I coupon as well and I used to have an accordian exactly like this. Until I had kids. With a child in the cart, you can’t put this down or they will dump it all out. Also, I found I’d have a ton of coupons behind each category and it would take me a while to thumb through it all. I ended up getting a 3 ring notebook and using plastic baseball card inserts and I find it to be much more efficient and easier to see what you’ve got. You end up with 4 pockets under each category so you can sub-divide. Under my “Beauty” category I have a pocket each for makeup, hair products, skin products & face products. Then, I converted this accordian organizer for non-grocery store coupons like; oil changes, restaurants, ULTA, Bed Bath & Beyond, etc. And like another reader mentioned – I try to keep them both in the car as much as possible. I’d never thought about keeping track of how much I save couponing. That’s an awesome idea! Thanks for ALL the great ideas. So glad I found you! 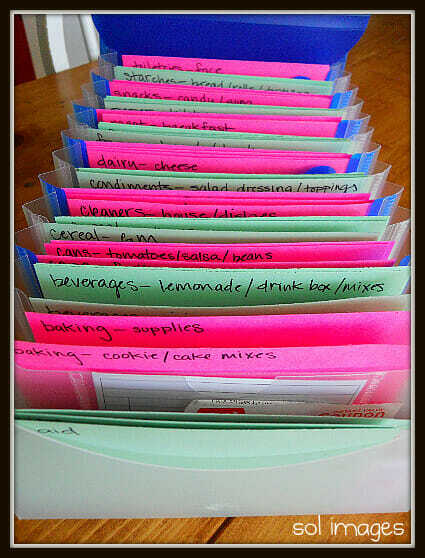 Sounds like a great method of coupon organizing — thanks for sharing! I always say that there’s no ONE right way to get organized. Whatever method works for you is the “right” method. Andrea, you talked at my MOPS group last week at Sunshine. I loved all the things that you taught us, but most of all the coupons. I went shopping this morning and ended up saving $44 in coupons and in store sales. I was amazed! What a great thing. I even went through and used your ideas for organizing them and it worked awesomely. Thank you so much, I will for sure be using this for a long time. Wow $44 — that IS amazing! Congrats Kelly! Thanks for the kind words, I’m glad my coupon organizer is working for you! I think the way you have all your coupons organized is perfect, but I’m wondering from where do you get so many coupons? Coupons save me money on non-food items. (I never seem to find coupons that say “$5 off 25 lb of bread flour”, you know?) Great idea for organizing them. My biggest challenge? Having them with me when I’m actually shopping. Now I keep them in the car!! Actually Gold Medal flour had coupons out this past winter. I was recently introduced to the savingaddiction.com site. These women are really into coupons and they are local (in the West Michigan area). Wow. I love the way that you organize them. 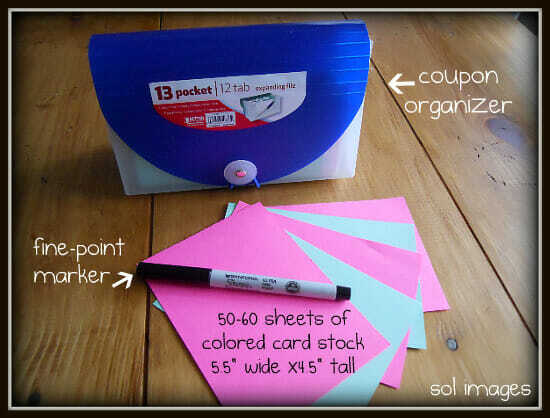 Very clever to use cardstock to make your own dividers! I just have a small coupon holder, and I have to admit that I am not using it as well as I should be. I really need to try printing some of those internet coupons too.